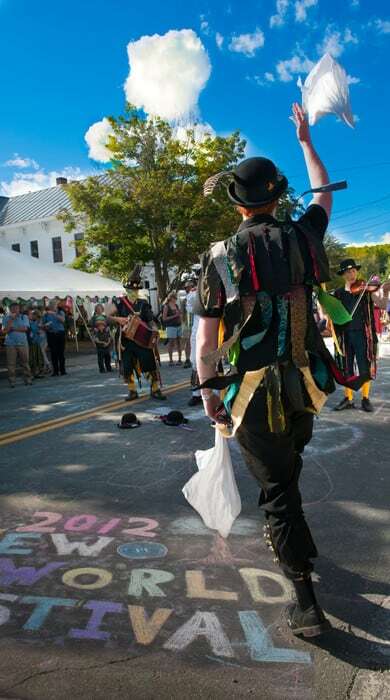 Sunday, Sept. 2, 12 p.m.—RANDOLPH—Chandler’s New World Festival will present a diverse array of the finest regional and international performers from the Celtic and French Canadian music and dance traditions on Labor Day Sunday, Sept. 2. Events go from noon-11 p.m. A stellar line-up headlined by Le Vent du Nord and Irish singer and guitarist John Doyle marks the 26th anniversary of one of Vermont’s most popular annual cultural heritage events. Several groups make their festival debut this year, including Le Vent du Nord, Natalie Haas (with her husband Yann Falquet, known to New World Festival fans as a member of the French Canadian power trio Genticorum), The Outside Track, and Musique à bouches. Many popular New World Festival artists make return appearances, including John Doyle, Connla, Night Tree, and Cantrip. Other musicians returning in new combinations to the festival this year include Owen Marshall and his band Copley Street; and Vermont native Eric Wright, cellist of The Fretless fame, joins Cape Breton fiddler Mairi Rankin in an inspired pairing. Chandler Center for the Arts is located at 71-73 Main St., Randolph. For tickets and more information, visit newworldfestival.com or call 802-728-6464. Prices for students 13-18 are greatly discounted, and those 12 and under are free. The event continues as a Top 10 Time-Honored Event, an honor given by the Vermont Chamber of Commerce to those that have been named a Top 10 Event 10 time or more. According to its website, in order to qualify as a Vermont Chamber of Commerce Top Ten Event, events must appeal to out-of-state visitors as well as Vermonters; appeal to a diverse audience, including children and families; and due to the additional attention a Top Ten garners, the event must be able to accommodate an influx of visitors up to twice the normal count. A mix of stellar music and entertaining activities will be a part of the New World Festival, named a Top 10 Time-Honored event by the Vermont Chamber of Commerce. In other words, don’t miss it!